Finally had the chance to open mine! Very happy, though the skinny 8" bodies on both Jokers make them hard to stand on their own. They look great open! I received mine, but I haven't had time to open them to inspect them yet. Outside of a small nick in the comic Joker's face, they look great in the package. The new Santa suit is very detailed. How did they do Cheetah's ears? She looks pretty good and will team nicely with Silver Swan. The Robin update came out great. THose are not the standard robin shoes. Did they upsize the 6" green shoes for the 8" figure? Or do they just fit? I liked Krypt0nite's Robin TT & SF kitbash, but the green was too dark of SF Robin to work for me, and this new Robin's tunic is much more detailed, like the comics. Nightwing might be a good candidate to move to a Type S body, if those forearm decos will fit. in trench ,and 2nd Santa on the way .then ill get robin ,nightwing (if its up again )and an "12 aquaman,Mary,Robin and Harley soon .between Mego & FTC its a good time to be a Mego guy . Nightwing is down again and they have a three figure Batman set, minus Nightwing. So odd. Especially since some of us have him already. Maybe they got shorted in their shipment. So, I just realized that Robin also uses the skinny body. I was considering doing a swap to a Mego 2.0 body and took him out of the package for the first time. That's when I noticed his green shorts were kind of loose. And the legs seemed skinnier too. Then I moved the arms out and up sideways... skinny body! Not good for a conversion, though the body is decent, so it doesn't need a swap. I did have a smaller pair of green shorts in the parts box, so I swapped those out; they are a little tight, but I didn't like the loose shorts, so it's an improvement for me. The Robin 2.0 shoes are softer than that the regular elf shoes, so I can keep those too. Since it's going to take a boot swap to put my extra Super Friends Batman onto any other body (I hate the FTC molded peg boot connection design! ), I think I will finally open the rest of these up tomorrow and inspect them. 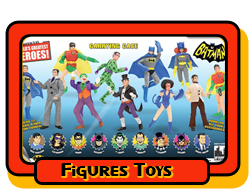 Nightwing is missing from FTC's website still... odd! Also, I think black Romulan boots would have worked nicely for Nightwing's boots too.